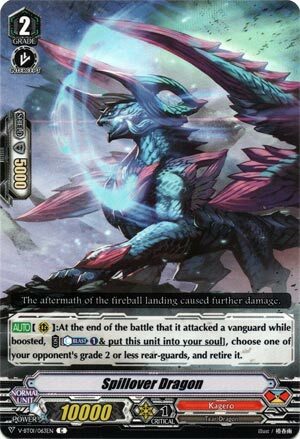 [AUTO](RC):At the end of the battle that it attacked a vanguard while boosted, COST [Counter Blast (1) & put this unit into your soul], choose one of your opponent’s grade 2 or less rear-guards, and retire it. Running on fumes here when it comes to whatever’s still interesting in the Q4 Booster, so I guess I’ll start with a card I warmed up to…eventually. Spillover doesn’t sound good, being a +0 wash for CB1, in an age where almost everything seems to be going +1 to you in some way, but the fact it still IS a +0 wash at all, coupled with how he directly fuels Overlord for another lousy turn is key. He also combines nicely with Aermo for defensive purposes: after attacking while boosting with Aermo, you then lose a low-shield card like this for a high-quality kill, then proc Aermo to increase hand and thus get more guard at your disposal for the opponent’s turn. Not really anything remotely amazing but it works somewhat. Took me a while to really, and I mean REALLY, get used to using.